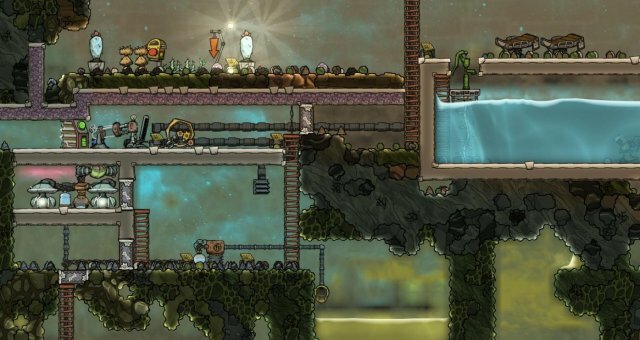 An explanation of the quirks behind the mechanics of pipes, and how they can be used to give more control over how fluids and gasses are distributed through your colony. Stress (How to Handle It). Liquid / Gas Valve Guide. Note that both liquid and gas pipes use these same mechanics. 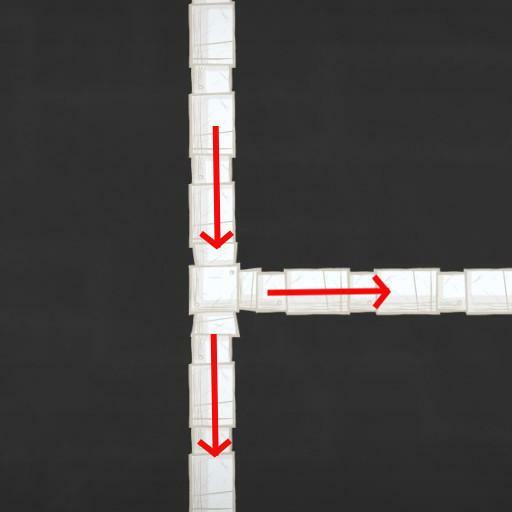 So the basic junction is easy enough to create, 3 or 4 pipes meeting at a single point. Should be good enough, right? Well maybe for a beginner, but they may not be able to distribute resources as efficiently as they could. Take the above junction for example. 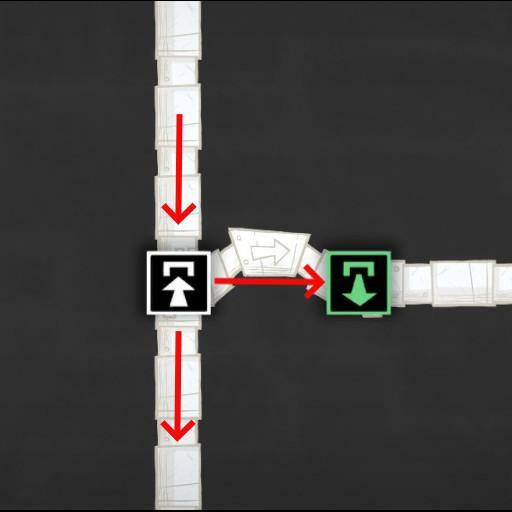 Gas will flow in from the top, and will alternate between taking the pipe below and to the right. Simple enough, right? However, what happens when one of the output pipes backs up? The gas will still try to flow into the backed up pipe, causing the flow to stop every other second, so you have half as much gas flowing through the junction. Not very ideal when you're trying to distribute oxygen throughout your colony. This is the opposite case, two pipes are inputs, one is an output. When you have a maximum flow of gas in both pipes, it alternates passing gas from each of the inputs to the output. However, unlike in the previous junction, if one of the inputs is completely empty, the gas flows through the other input into the output without stopping. So in order to have better control over how resources flow through the pipes, you might think we'd need to use shutoffs and automation wires. Not necessarily! In more elaborate setups, we can actually get the resources to go where we want to go just by using inputs and outputs. 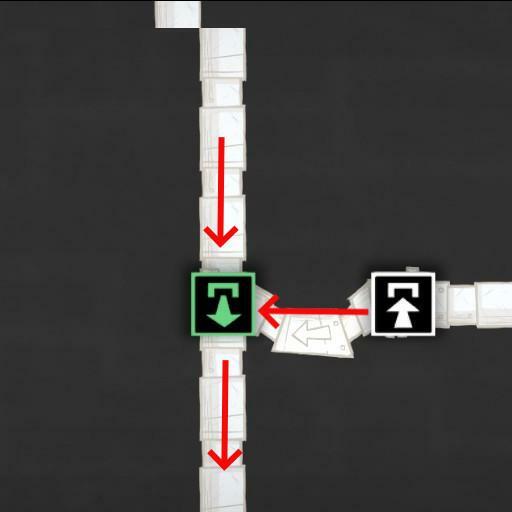 When a pipe goes straight through an input, all flow goes in, unless the input is backed up, in which case it goes straight through without stopping. It will also take resources from the packet as it passes through, if there's not enough room for a whole packet. When a pipe goes through an output, resources will only be output if there's room: If a packet going through it is less than full, it will be topped up. No resources will be output if the pipe before it is backed up. So what can we do with this information? The key is to use bridges: they act as one way valves with an input and and output, and unlike the actual valves, they can go behind walls and other objects. Lets take a look at some Junctions that use bridges. In this junction, flow is prioritized out the bridge. If one of the outputs is blocked, flow will go out the other output uninterrupted. In my own colonies, i use this for oxygen distribution: production won't be stalled just because one area of my base is overpressured. In this junction, the bridge only feeds into the pipe if the pipe isn't at capacity. I use this for supplying water to the electrolyzers. Since the gas being output from the electrolyzers is at a fixed temperature, i make sure to use the hottest water first, prioritizing the water straight from steam geysers, then the water from the sieves, and finally, the chilled water intended for agriculture. Thanks to this technique, i accomplish this with no automation whatsoever.